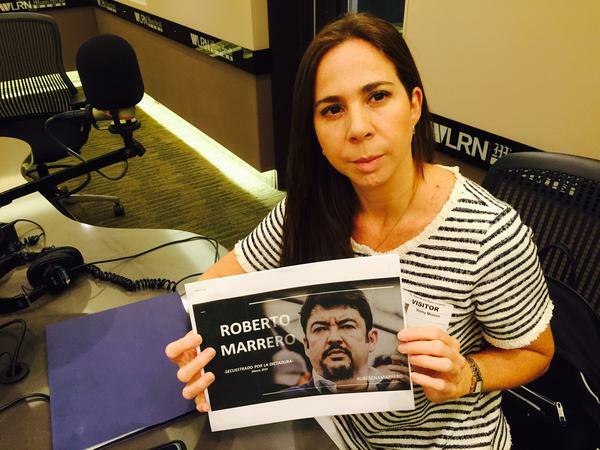 Romy Moreno with a picture of her husband, jailed Venezuelan opposition leader Roberto Marrero, at the WLRN studios in Doral. Venezuelan art dealer Romy Moreno was in South Florida last month when she got an urgent call from her husband, Roberto Marrero, in Caracas. Agents of Venezuela's authoritarian President Nicolás Maduro were ransacking their apartment and arresting Marrero – who is the chief of staff to Venezuelan opposition leader Juan Guaidó. The U.S. and 50 other countries recognize Guaidó as Venezuela's legitimate president. Marrero is now in prison awaiting trial. His wife is with relatives in Doral, and cannot return to Venezuela for fear she too will be arrested. Moreno spoke with WLRN’s Tim Padgett about what she calls her husband's kidnapping by the Maduro government – and the ongoing movement to topple that regime. WLRN: You were not in Caracas on March 21st. Where were you, and how did you find out your husband had been arrested? And so everybody was shouting, and the [security agents] get into the building by force. And they were trying to get my husband. My husband was on the phone telling me, “Listen, they are knocking down our door. I love you. Please take care. We are...we're going to be fine.” Trying, you know, to make the moment less awful than it was. I was hearing [all this] by the phone until they get in – because after that he just said, “They are here.” And we lost communication. What did they do to your apartment? They destroyed almost everything. My room, my boy’s room, his toys. They planted guns. Those planted guns they used as evidence, then, in the charges they made against your husband for being a “terrorist”? Yes, exactly. Roberto's not a terrorist. He's an extraordinary man who works to help people. He’s a lawyer well-known for fighting for democracy, but he's also helped set up a network of humanitarian aid around Venezuela. He was the secretary of the National Assembly, and President Juan Guaidó named Roberto his chief of staff. That's why he was kidnapped by Nicolás Maduro. The only terrorist is the government. You now cannot go back to Venezuela. Yeah, that is true, because I'm afraid for my life and my 7-year-old boy, if we go back. And in the meantime your husband is in Helicoide Prison in Caracas. No one has been able to see him there. Not even the lawyers. They just saw him in the [preliminary] hearing and that's it. And you have not been able to talk with him since March 21st when he was arrested? You met here recently with Senator Rick Scott, and you also met with the secretary general of the Organization of American States, Luis Almagro. Do you think the United States and the international community are now pressuring the Maduro regime to release your husband? They are trying to figure out how to help the most. But I think there have to be stronger actions. I mean, the United States and many other countries put sanctions against Maduro; but those are not enough. We have to be doing more. A lot of Venezuelans in the diaspora here are beginning to suggest that the United States consider military intervention to end this crisis in Venezuela. Do you share that belief? Well, I don't know. I'm not a politician. The United States has been such a great help, but this can't be just the work of the United States. I think it has to be like a coalition. Colombia, Argentina, Chile and Europe, because of the humanitarian catastrophe we are passing through. What is daily life in Venezuela like right now going now? Going out of your house and watching people eating from the garbage. It's not easy. It's happening every day. You see people drinking water from a river which is very dirty. Kids die in a hospital because we have no medications. Five million people have left the country. Still, there's a lot of people who don’t consider how serious the Venezuelan crisis is for the hemisphere.